With nearly 4,000 global entries, the Academy of Interactive and Visual Arts (AIVA) awarded the Educate & Elevate Campaign a total of six Davey’s. The Davey Awards are judged and overseen by the AIVA, a 700+ member organization of leading professionals from various disciplines of the visual arts dedicated to embracing progress and the evolving nature of traditional and interactive media. Current membership represents a “Who’s Who” of acclaimed media, advertising, and marketing firms including Condé Nast, Disney, General Electric, Microsoft, Monster.com, MTV, and Yahoo! to name a few. The campaign received a Gold Davey for its 2017 integrated campaign. 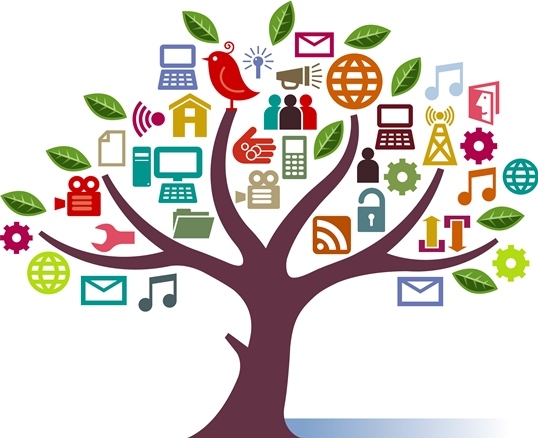 An integrated campaign uses a combination of mediums like digital, print, public relations, and eMarketing to ensure that messages are consistent and received by the greatest possible number of people within the target market. Additionally, the Educate & Elevate website received two Gold Daveys and two Silver Daveys for visual appeal, copy writing, and homepage design. The campaign video was also awarded a Silver Davey. Adult Education Miracle: Kevin Hunt Sr.
As adult educators, we know firsthand that a lack of education can have a ripple effect among individuals who want to advance their economic and social mobility. Kevin Hunt Sr. knows that downward spiral all too well. Kevin dropped out of school in junior high, and because of his lack of education, he had to rely on his family in his hometown of Little Rock, Arkansas, for financial support. In 2001, he made a decision that would be the catalyst for changing his entire life: he enrolled in Shorter College’s GED® program. After earning his GED® credential, Kevin did not stop there. In 2002, he enrolled in Philander Smith College where he graduated with honors and followed that with a master’s degree from Webster University. Upon graduating from Philander Smith College, Kevin volunteered for then-Attorney General Mike Beebe’s campaign for governor. This eventually led to a part-time job working for Beebe’s campaign. Beebe won the gubernatorial election (2006), and Kevin was hired on as full-time staff. During the next eight years in the office of Governor Mike Beebe, Kevin worked as a communications assistant, spending five of those years as minority affairs liaison. A man of God, Kevin joined Second Baptist Church in 2005, under the leadership of the Pastor, Dr. Kevin A. Kelly. Kevin works at the University of Arkansas for the Center on Community Philanthropy at the Clinton School of Public Service, which focuses on community-based philanthropy. He is the son of a very strong mother, grandmother, and great-grandmother. He is also the proud father of one son, Kevin Hunt Jr. He’s married to the number one woman in his life, Maggie F. Hunt. The more success stories such as Kevin’s are heard in public, the better-positioned adult education advocates are likely to be in making a case for securing resources for vital adult education programs. Click here to submit your success stories to the Educate & Elevate campaign and speak up for adult education. ALAPCAE, the Alabama Association for Public Continuing and Adult Education, has a mission of promoting public awareness of the Alabama Adult Education program, to address the professional development needs of Alabama’s adult education practitioners, to recognize excellence of instructional services, and to provide scholarships to deserving GED® graduates throughout Alabama. The association is also a strong advocate in promoting the Educate & Elevate Campaign. Want to follow Alabama’s lead and garner attention for the great work in your state? Use our Campaign Toolkit. The toolkit makes it easy for you to announce your partnership with the campaign via your website and social media accounts with a tailored press release and much more. 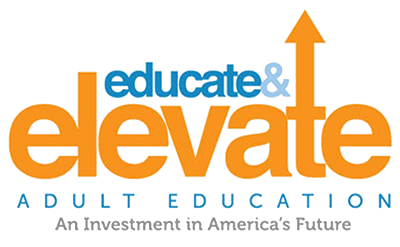 The Educate & Elevate Campaign is leading the charge to raise awareness about the many faces and relevance of adult education. Federal budget proposals for 2018 suggest a cut of $95 million to adult education programs, including literacy courses, as part of a larger $9 billion cut to the Department of Education budget. 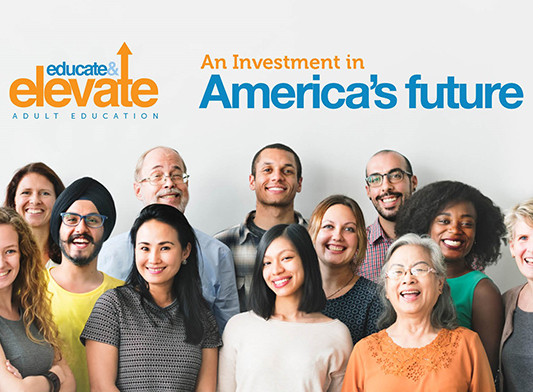 To help safeguard these vital programs, the Educate & Elevate Campaign is a national endeavor aimed at highlighting how an investment in adult education represents a bold commitment to America’s future. A big part of the campaign is to highlight success stories and the many surprising faces of adult learners who are advocates for adult education. 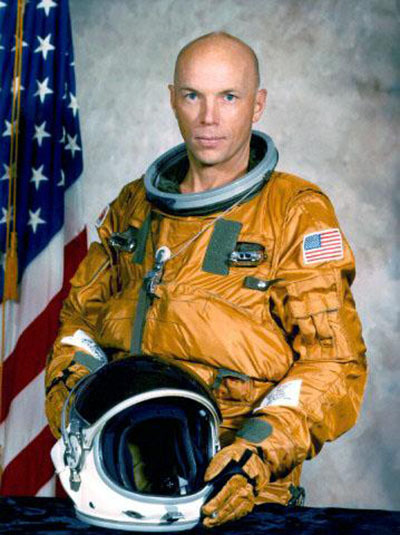 Story Musgrave is one such example who is an advocate for the campaign. Mr. Musgrave has an amazing story in that he never finished school, but instead ran off to Korea with the U.S. Marines where he was an aircraft electrician and an engine mechanic. He started flying with the Marines and over the next 55 years accumulated 18,000 hours in more than 160 aircraft. Using adult education as a catalyst for change, Mr. Musgrave obtained a GED® diploma and went on to become the only astronaut to have flown in all five space shuttles resulting in six space flights. 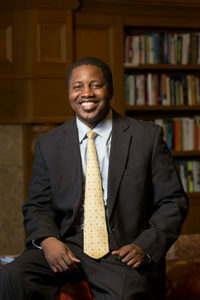 He has earned seven graduate degrees and 20 honorary doctorate degrees. In the coming weeks, expect to hear more stories from leaders like Musgrave about the value of adult education as Educate & Elevate seeks to advocate for this vital resource. If you have an extraordinary example of someone who has used adult education as a catalyst, resulting in exceptional success, contact us at educateandelevate@coabe.org. 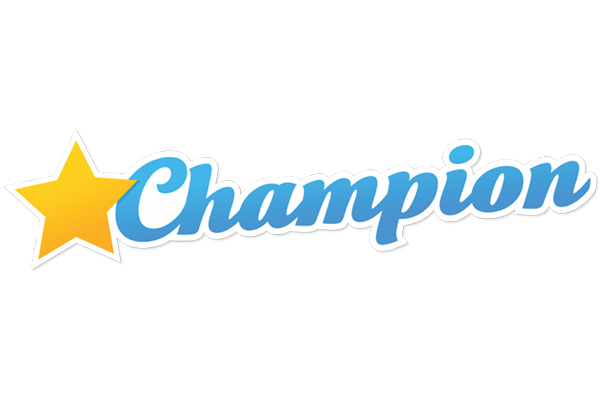 There are many ways that states can become a champion of the national Educate & Elevate Campaign. This week we recognize Wisconsin Literacy for its efforts to link to the national campaign by creating a landing page to educate its members with specific calls to action to support adult education. Replicate Wisconsin’s efforts and use our toolkit to announce your partnership with the campaign via your website and social media accounts, a tailored press release and much more. Noted below is the website content that Wisconsin Literacy used to announce its participation in the Educate & Elevate Campaign. How will you announce your statewide efforts? 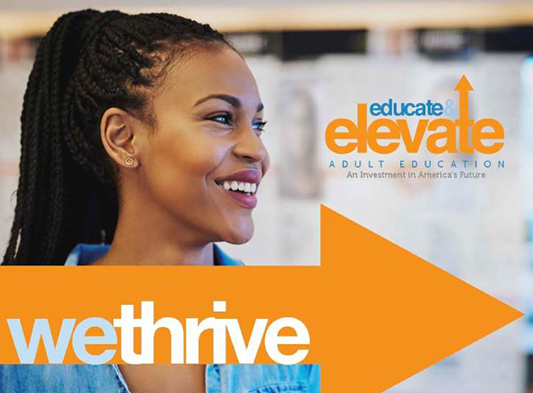 This year, Wisconsin Literacy is joining the more than 55,000 adult literacy educators participating in COABE’s Educate and Elevate Campaign. 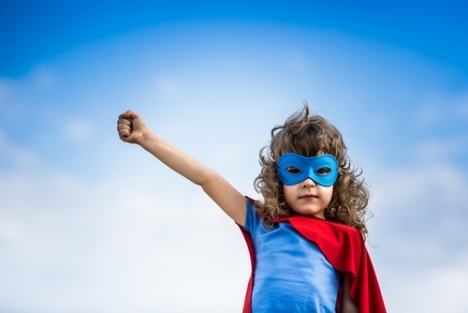 Never underestimate the power of one voice to the right listener! Wisconsin Literacy, Inc. encourages its friends, members, and other stakeholders to raise their voices for the importance of supporting a more literate Wisconsin. You can help by speaking to your local, state or federal elected officials and letting them know about your involvement with literacy. Whether you are a literacy tutor, student, program director, or just someone who believes literacy is a skill we must invest in more, you can have an impact! Share your literacy success stories! With about six weeks to go until our Capitol Hill visits, the Educate & Elevate campaign website has been expanded with state-specific pages to give state leaders an opportunity to showcase all of their great successes and innovations. Click (here) to check out the new Locator Map and then select your state. You’ll see a section that houses state contacts, data, reports and innovations and successes. If you don’t see any innovations or success stories about adult learners and/or employers, then it’s time to use the links below to submit. We’ll be pushing legislators to your state-specific pages to learn more about what you are doing, so make sure to submit now! Did you know that cross promoting the Educate & Elevate campaign on your website can bring recognition to your organization? And, we’ve made it super easy for you to participate. Take a look at the following Educate & Elevate Champions who have been very creative in their cross-promotional efforts by placing the Educate & Elevate logo on their websites in various locations as a “proud partner”; using #educate&elevate and sending updates via social media; special announcements; and sending eblasts to its members with updates. Do you want to cross promote the campaign? Check out our Campaign Toolkit for assets. 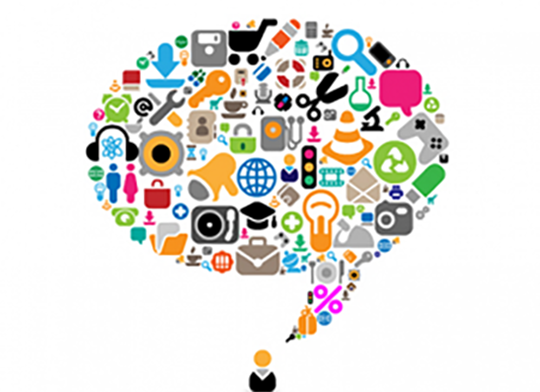 Our latest webinar on Social Media Strategies is now online! If you missed it, you can still learn the latest tools and techniques for using social media to promote adult education. Our communications partner, Full Capacity Marketing, and guest presenters, Jeff Arnott from Brevard Public Schools Program and Chris Binnix, Marketing Coordinator at COABE presented best practices for using social media in advocacy, shared recent social media success stories and discussed how to enhance your social media program using the Educate and Elevate toolkit. 1. Engage with Your local press on Twitter – One of the most effective ways to build your following is by engaging with local reporters. Many reporters tweet from their own account, in addition to the official media account. Use the Twitter search box to search for “people” with the press outlet name in their account description. 2. Learn how to use the new Facebook Townhall function – This new option for nonprofit and public sector accounts lets you link posts directly to your federal, state or local legislator. 3. Use Links, Graphics, and Hashtags – Including hashtags, visuals, and links to news articles and other accounts shows a level of social media know-how that helps attract the notice of influencers on each channel. 4. 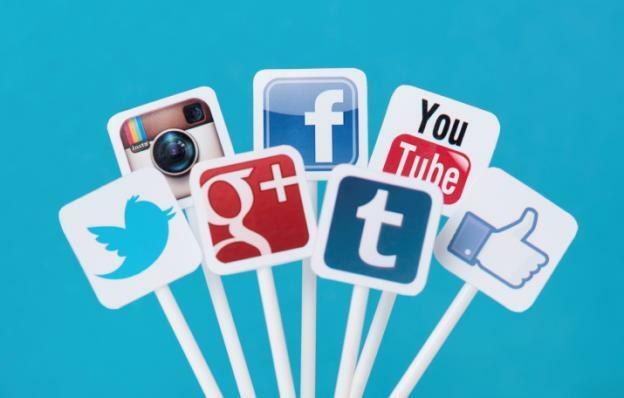 Use time management tools for social media – Using scheduling tools, an editorial calendar and adding social media accounts to mobile devices can enable you to be more effective in less time. 5. Engage with legislators and their staffs on social media – In addition to official accounts, many legislators, and their staff members, volunteers and interns have personal accounts on Twitter. Many legislators also have several Facebook pages for different initiatives. Searching and following these additional accounts can raise your visibility with your legislative office. Did you miss our most recent webinar or want to watch it again? It’s now online and includes critical information you won’t want to miss on using special events to educate legislators and key stakeholders about adult education. Our communications partner, Full Capacity Marketing, and guest presenter, Diane Jackson from the Queen Creek Unified School District Adult Education Program in Arizona, share step-by-step instructions, as well as strategies in an information-packed, one-hour session. Here are the Top 5 highlights, along with links to everything you need in the Educate & Elevate Campaign Toolkit to host your own successful stakeholder event. Think Visual. Include a proclamation ceremony, set up information stations or conduct a tour or mini-class. Sharing about your program in a visual way makes events more memorable and newsworthy. Showcase your students. Schedule times for them to share their success stories, plan photo ops and introduce legislators and news media to your students. Showcase Employer Partners. Employers add credibility to your program. Invite them to speak about what your program has meant for their business. Promote, Promote, Promote – Use the Educate & Elevate Toolkit Media Advisory template to announce your event. Use the toolkit fact sheets, legislator talking points, posters and postcards to promote your event. Employ cause marketing, a growing opportunity for nonprofits and public sector organizations to partner with local companies on events. In this webinar, we show you how to create a cause-marketing partnership, and we walk through several powerful case studies. When we advocate for adult education, we tell lots of stories. We show how adult education has changed the lives of our students. We talk about what adult education means to families. We share personal stories about how adult education has impacted our communities. Timely and accurate data woven into our stories provides context for personal narratives and provides legislators with talking points to support our mission. The Educate & Elevate campaign is all about data. The campaign was developed specifically to give adult educators tools to show legislators how adult education is an investment in America. 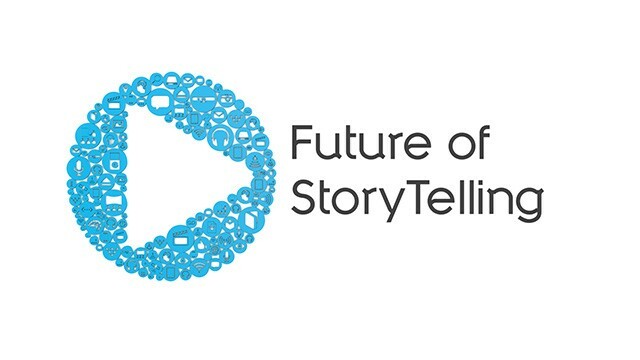 Check out the complete toolkit for more ways to harness the power of data to tell your story. A campaign video to use on your social media channels and state and local websites. A Campaign Fact Sheet you can send, take to meetings with reporters or use to create posts on your social media channels. Educate & Elevate Twitter and Facebook accounts that you can engage with and mine for post ideas to share on your own channels. Adult education — you know it’s your passion. So share your passion through our national campaign, Educate & Elevate, and join the system of 55,000 adult educators in informing elected officials about the importance of funding adult education. Inform and educate officials about the relevancy of adult education through data, stories, innovations, and key message points. Make specific requests in support of funding adult education. How can you, as one adult educator, make a difference to achieve these goals? 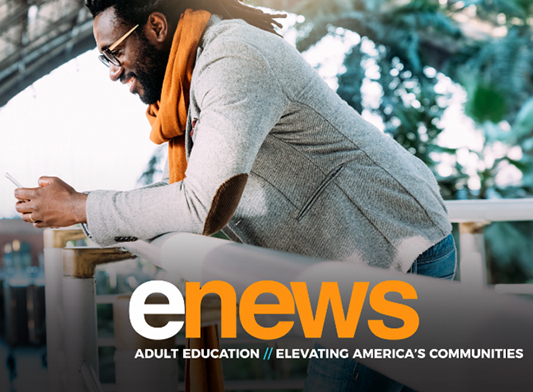 Our plug-and-play Campaign Toolkit gives you many ways to garner recognition for your local adult education brand while advancing our collective mission to secure funding. Register for the Learning Forum and review past webinars and materials. Get the Campaign Toolkit for strategies to build your local brand. Have a question or need help? Post it in the Learning Forum and get technical assistance. Here are three quick strategies to build funding support for adult education with your students, family, and friends. Share this link with your friends, family, and colleagues to send a ready-made support email to state and federal elected officials. The template automatically finds the right contact based on the zip code submitted. Share this link with your adult learners/students to send a ready-made support email template to their state and federal elected officials. Students can add their stories, sharing how adult education made a difference in their lives. This template also automatically finds the right contact based on the zip code submitted. Complete and print copies of this editable postcard to bring to class, and have students sign and mail to your local, state and federal officials.